I love that saying and I am starting to re-read the book. In Matthew 14:22-33 we see the account of Jesus walking on the water. Peter questioned Jesus from the boat and said, “Lord, if it’s you, tell me to come to you on the water.” And Jesus said, “Come”. I can just see Peter leaping out of the boat and walking toward Jesus and then realizing what he was doing and getting scared!! It reminds me of a toddler who is just starting to take a few steps. He realizes what he is doing and panics, sinking to the floor crying in fear. It’s new. It’s unknown. It is scary. What is God calling you to do today that’s scary? Is He calling you to step out of the boat and into the treacherous waters? Are you excited but a little scared, too? Faith is an action word. If you do something because you know the outcome, there’s no faith in that but when you do something without knowing the outcome, then that’s faith. If your heart is pounding and you are getting weak just reading this because the Lord is telling you, “it’s time”, then do it! Put down your coffee, take off your shoes and dip your toe in the water. Now walk toward Jesus and where He is leading. It’s going to be a little nerve wrecking but keep your eyes on Jesus and He will lead you right across the windy waves and onto dry land. 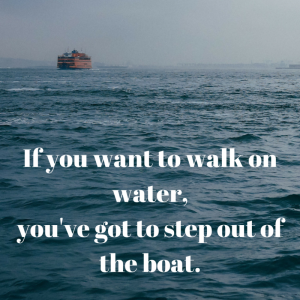 Because, you see, if you want to put faith into action and walk on water, you’ve got to first step out of the boat. Let’s do this together. Let me know where your sea of water is leading you. This entry was posted on October 5, 2017 with tags: #makeadifferenceeveryday, #walkonwater, faith by Deanna Young.